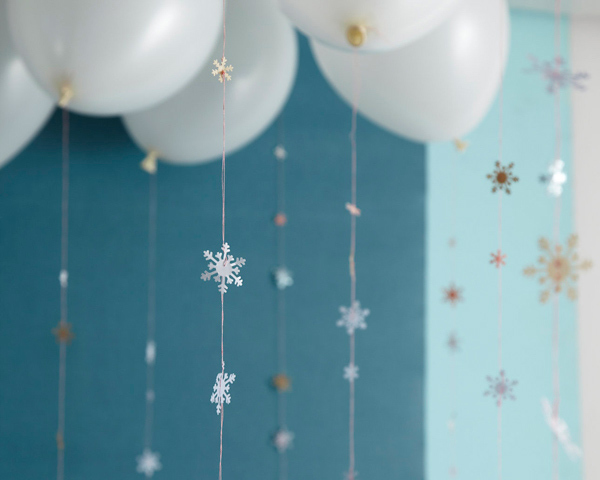 Can you envision walking into a party where hundreds of tiny snowflakes dance their way down from the ceiling? That’s what I set out to create with this floating snowflake garland. We haven’t had a lot of snow in Brooklyn this winter – just a few days ago it was 60°! I think I’m missing our usual snow here in New England, and this garland will set the winter wonderland theme for any Holiday party. 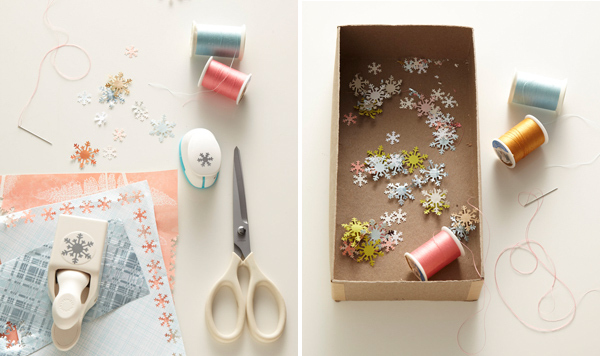 Step 1: Begin by punching out lots of paper snowflakes. I had two different sizes, but one will do quite nicely. You can choose any color paper, but I went with pale blue, pink, white and a little bit of light green. Gather your snowflakes, and grab your thread and needle. Step 2: Thread about 1 yard of thread onto your needle. Knot the very end. 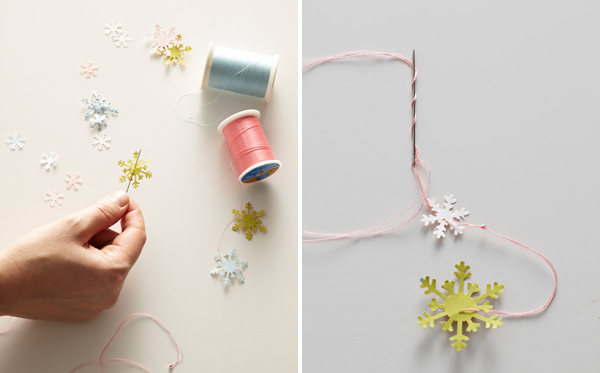 Sew through your first paper snowflake and push it down to the end. Step 3: Create a french knot about 1 inch away from your previously threaded snowflake. This will be the barrier that keeps the next snowflake from slipping down and resting on the last one. Continue this process until you have about 8 – 10 snowflakes per thread. At this point, I taped my thread to the wall for safekeeping until I was able to attach them to the balloons. Step 4: Blow up a balloon, tie a knot in it. 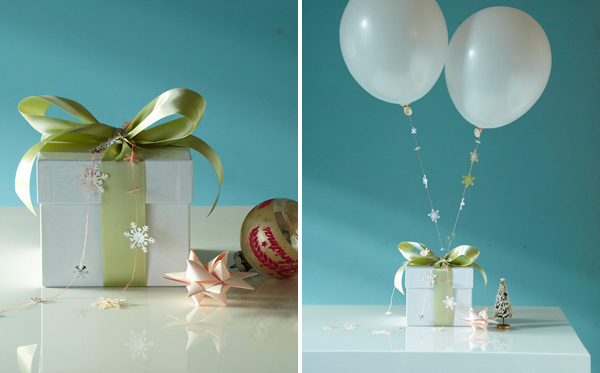 Gently take a garland, being careful not to tangle it against itself, and tie or tape it to the knot of the balloon. Release and let it float to the ceiling. 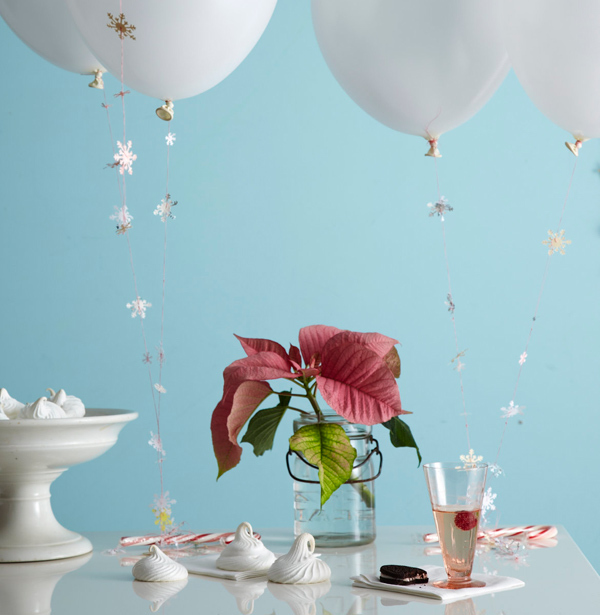 The delicate snowflakes look so pretty hanging together ~ it makes for a very festive party! And, it’s the craft that keeps on giving. 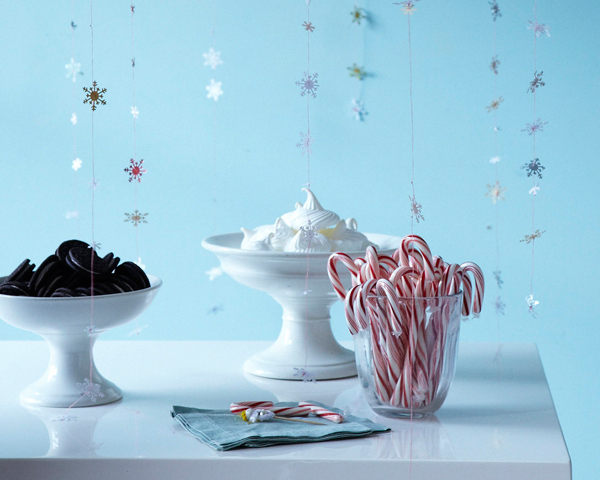 When the party is over, there are so many uses for the snowflake garlands. 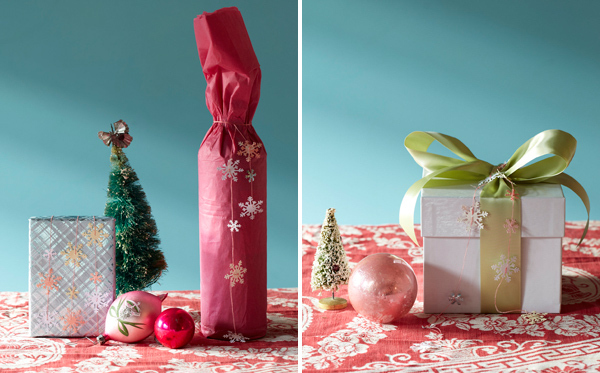 Wrap gifts, decorate a mini-tree, tie them to candy canes and rest them on a mantel or table, or simply hang them in the window. Let it snow, let it snow, let it snow! Pretty! I love how it has many uses. I actually made a snowflake “garland” myself…using dowel rods and garland… just reminded me of this post and so I thought I’d share! So pretty and delicate. I love the way the snowflakes look falling from the balloons! Love using these on the gifts! What a cute and festive idea! I love this! I would keep it up all winter Thanks for sharing. I just love this. With all the beautiful punches you can get these days, this could translate to other themes for other times of year too — such as leaves to turn brightly-colored balloons into a floating flower garden? Chiara is so talented! We’re lucky to have her as a contributor! This is so lovely – I think it would be amazing at a sparkely winter wedding! Off topic question – you mentioned no snow Brooklyn, but also that you were in New England, do New Yorkers consider themselves part of NE? I thought that was just ME, NH, VT, MA, CT and RI? Sorry to be nit-picky, I’m really not sure! c’est bien trop joli comme idée! Oh my gosh! This is so perfect. My baby was born last Christmas Eve and her first birthday (on Saturday) is a snowflake theme. Can’t wait to deck the house out in these! Can anyone tell me where the white pedestal bowls are from? Thank you! It’s so prety, but I don’t have the time to make it! Very Pretty, Thank You & “Merry Christmas” ! beautiful in every way! delightful, playful and delicate all at once. This is really pretty and so effective! Lovely idea. This is really, very lovely. The color palette in the photos is really well done, too. Yes, it’s true – New York is not in New England. I grew up in Connecticut though, so I still think of Christmastime in New England. The pedestal bowls are vintage white ironstone. You can find them on etsy or ebay. Beautiful! Must try this next year! 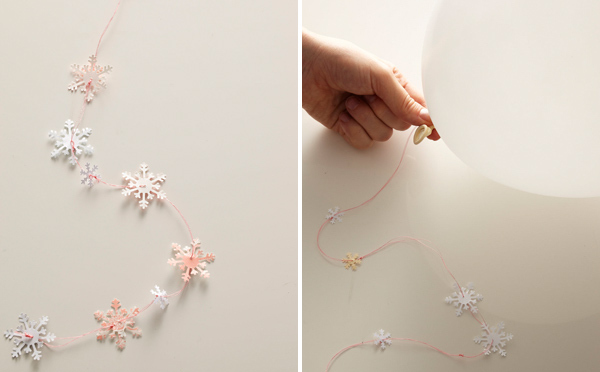 very cute garland, love how it translates to any party that you have balloon decor!! love it! This is great! What a festive and fun way to add unique touches to holiday decorations!